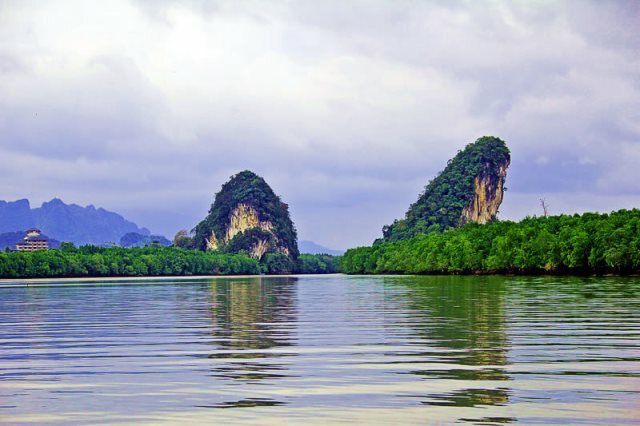 The two mountains on Krabi River both stand 100 meters high above the water and are deemed the symbol of the province. When going near the two mountains, you can climb on the adjacent staircases and come across several beautiful caves. Inside the caves are impressive stalactites and stalagmites which are worth exploring. There are also colored cave paintings, with drawings of prehistoric dwellers and more. Also, remains of human skeletons are found in the place in significant number. According to theories, these are remnants of past settlers who established a home at Khao Khanab Nam but were wiped out by a deluge and suddenly perished. As part of your Krabi ecotourism exploration, you can catch a longtail boat from the Chao Fa pier. And usually, it only takes 15 – 20 minutes to travel the whole site: that’s from the two mountain peaks up until Ko Klang fishery village. For tourists who want to explore more extensively, it is possible to rent a boat to visit the mangrove forests, the fishery village in Ko Klang and Khao Khanab Nam. There are no admission fees and the trip typically costs around 300 baht. Because of its serene and calm atmosphere, it becomes an ideal place for sightseeing by canoe, particularly for couples as they pass along fringing mangroves and still waters. Not far from the Khanab Nam peaks is the small community of Ko Klang and the site features many traditional and cultural treasures such as a museum and a handicraft house that showcases plenty of traditional utensils, tools and souvenirs like the Huang Thong boat. Visitors can witness the simple way of life of the locals and their old customs such as cotton weaving and fish breeding using floating baskets. More and more adventurous folks are going to Krabi to inevitably travel to Khao Khanab Nam to climb the limestone mountain. The two peaks also have a mysterious charm, especially to travelers. Besides climbing the massif, the experience of riding on the boat from Chao Fa pier reaching to the mountains is always fun and exciting in itself. Fortunately, the place can be visited all year round although the best months would be from November to May. The best time of the day to go is during 6 am – 9 am in the morning or 3pm to 5pm in the afternoon. There are also a number of hotels and restaurants near the place of Khanab Nam.